“The ability to join distant cultures and stylistic approaches, to cover their mysterious and fascinating artistic existences has, during jazz history, identified and brought to celebrity many great musicians and the restlessness of their creativity. Miles Davis has been one of the founders of this experimental methodology, which represented the split from what was for “jazzophilies”, critics and many colleagues, the regular direction and conservation of a language already rich regarding its multi-cultural facet. 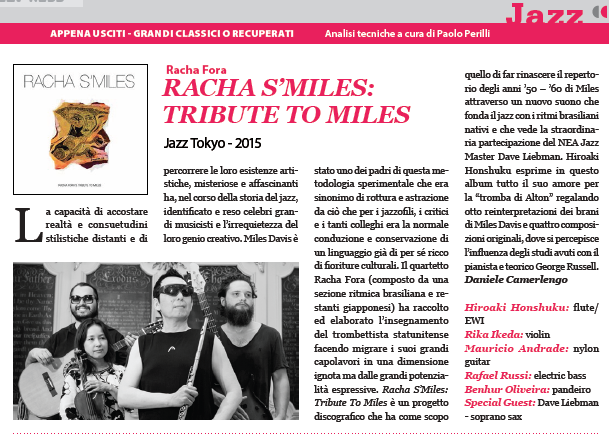 Racha Fora Quintet (formed by a Brazilian rhythm section and the rest being Japanese musicians), has gathered and elaborated the teachings of the American trumpeter migrating his greatest pieces into an unknown but greatly expressive dimension. Reacha S’Miles: Tribute to Miles Davis is a recording project with the goal to bring back Miles 50’s and 60’s repertoire through a new sound which merges jazz with native Brazilian rhythms and hosted the extraordinary participation of NEA Jazz Master Dave Liebman.